Located along the eastern coast of the Delmarva Peninsula, Assateague Island is a 37-mile-long barrier island jointly incorporated as part of the states of Maryland and Virginia, featuring several national and state seashores, wildlife refuges, and park areas. Throughout its history, the structure of Assateague Island has changed dramatically due to the movement of littoral zone sand. Prior to 1933, the island was connected to nearby Fenwick Island, but that year’s Chesapeake-Potomac hurricane created an inlet and separated the land area that now encompasses Assateague, separating it from nearby Ocean City, Maryland. Modern human occupation of the land of Assateague Island dates back to the mid-19th century, with the establishment of small communities such as Green Run and Assateague Village, primarily inhabited by fishermen and workers with the United States Life-Saving Service, a predecessor of the United States Coast Guard. Though Green Run offered a resort hotel that served as a popular tourist destination throughout the late 19th and early 20th centuries, by the 1920s, the population of both villages had declined significantly. Following the 1933 Chesapeake-Potomac hurricane, a permanent fortified network of artificial jetties was installed to preserve the newly-created inlet as a navigational waterway. In 1943, the Chincoteague National Wildlife Refuge was developed by the State of Virginia, and in 1956, a two-mile portion of the island was developed by the State of Maryland as Assateague State Park. Throughout the 1950s, plans were embarked on to create a new resort town on the island called Ocean Beach, with proposals laid out for affordable housing, commercial zones, public visitor amenities, and coastal highways. However, the damage caused by the Ash Wednesday Storm of 1962 illustrated that the island was too vulnerable to storm damage for the creation of permanent commercial and housing structures. In 1965, much of the island’s land was purchased by the federal government for the creation of Assateague Island National Seashore. Today, Assateague Island is jointly incorporated as part of the states of Maryland and Virginia, with the southern third of the island located in Virginia and the northern two-thirds located in Maryland. The island’s land is owned in part by the National Park Service, United States Fish and Wildlife Service, and Maryland State Parks agencies. It remains the largest natural barrier island region in the Mid Atlantic that is primarily undeveloped and preserved as natural wilderness area. As of 2006, no private property or residences are maintained on the island. More than one million annual visitors come to the island’s natural facilities, which offer a variety of opportunities for outdoor visitor activities such as swimming, surfing, kayaking, and wildlife watching. 41,346 acres of the island’s land and surrounding waters are protected as part of Assateague Island National Seashore, which is open to the public year-round. The 14,000-acre Chincoteague National Wildlife Refuge is open seasonally and primarily located on the island’s Virginia side, with a small portion entering the Maryland side. 800 acres on the island’s Maryland side are also preserved as Assateague State Park, which contains most of the island’s developed visitor facilities and amenities. More than 320 species of birds are found on the island, including great blue herons, American oystercatchers, snowy egrets, and the threatened piping plover. 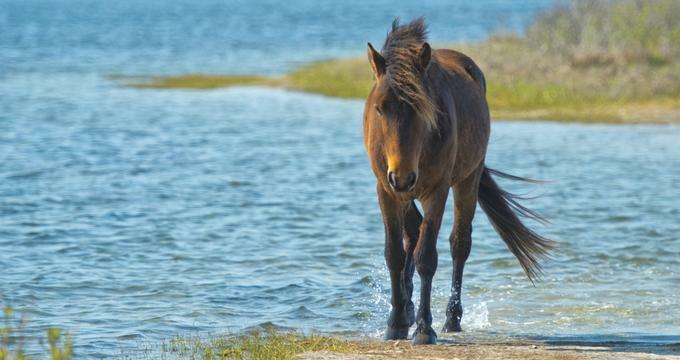 The island is best known for its feral horse population, referred to as the Assateague horse in Maryland and the Chincoteague pony in Virginia. The species’ classification as a horse or pony species is disputed due to its small size and horse phenotype, with some scientists arguing that the horses remain small due to environmental conditions rather than genetic ones. The horses may have evolved from domesticated ancestors aboard a shipwrecked Spanish galleon, though some believe that they were colonial horses allowed to run wild. In the 20th century, the horses gained public notoriety due to the children’s book Misty of Chincoteague and now serve as popular tourist attractions and photography subjects. Maryland populations are managed by the National Park Service, while Virginia populations are overseen by the Chincoteague Volunteer Fire Company. Two National Parks Service visitor centers are maintained throughout the island, including the Toms Cove Visitor Center, which is located within Chincoteague National Wildlife Refuge. A variety of exhibits are housed within the center, including an exhibit focusing on beachcombing. At the Assateague Island Visitor Center, daily showings of a documentary on the island’s wild horse population are offered periodically. Both facilities feature a marine aquarium with a touch tank, an Eastern National bookstore, and visitor amenities and serve as a trailhead for regularly-scheduled visitor educational programming. Campfire sites, fishing passes, and over-sand vehicle permits may be reserved at the Toms Cove Visitor Center. A variety of hiking trails are offered throughout the island, including the 3 ¼-mile Wildlife Loop, the 1 ½-mile Woodland Trail, and the mile-long Black Duck Marsh Trail. Paved bicycle paths are offered on both the Maryland and Virginia sides, connecting the island with the mainland. A 12-mile area within the Maryland side permits over-sand vehicles, and many water areas allow canoeing and kayaking. Lifeguarded beach areas are provided throughout the summer months on both the Maryland and Virginia sides of the island. Other popular visitor activities include surfing, surf fishing, shellfishing, and shell collecting. 350 campsites are offered within Assateague State Park, with car camping permitted by reservation within the National Seashore. A variety of educational programming is offered by the National Seashore, including curriculum-incorporated field trip opportunities for elementary and secondary school students. Ranger-led programming is offered for visitors of all ages, including family and children’s educational programming related to barrier island ecosystems. A Junior Ranger program is also offered, presenting young park visitors with certificates and badges for completion of park activities.